Good morning, B2B readers! I have an awesome guest post for you today which has some tips & tricks to help you run faster. 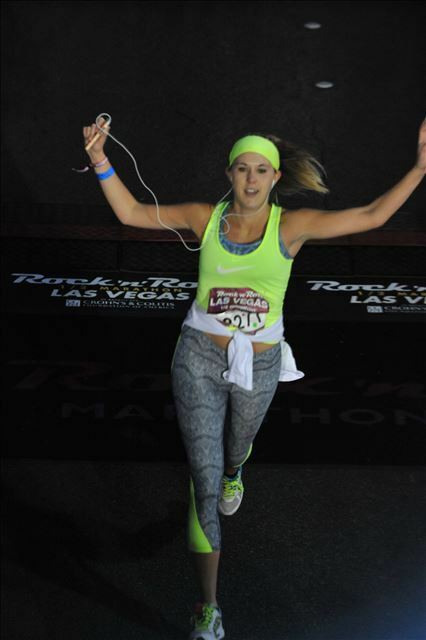 What I love about this post is that my friend, Meaghan, is super real about the fact she hasn’t always been a runner and that it didn’t always come easy to her. I really believe that some people are just better at running than others, so when I hear tips from people who are just natural runners, my first thought it “yeah, easy for you to say! Running isn’t hard for you!”. However, when Meaghan started telling me about her recent running updates, I actually listened and thought “wow, she’s probably right- that’s a good idea”. I remember getting texts from her a few years ago when she got back into running/working out more consistently, but it seems like over the past 6 months- a year she has really exploded with her running. 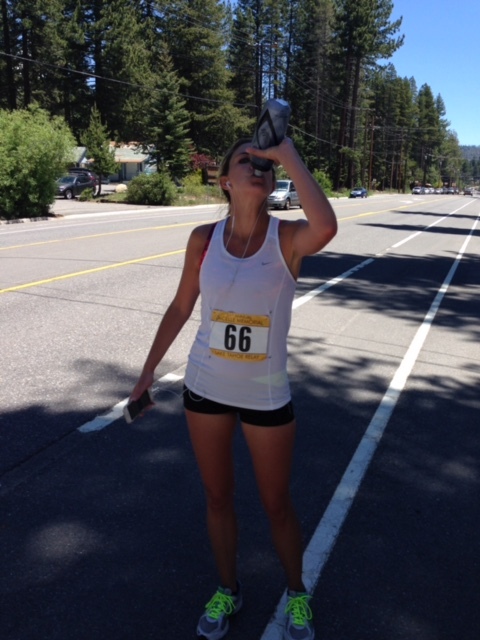 Her mile times are much faster than they used to be and she’s running races all over the country- literally. I love that she has made running her ‘thing’ and when we were catching up the other day and she was telling me about all her races and times and improvements, I knew I had to have her share those same tips with all of you. If you’re looking to get better and faster at running, I hope you enjoy these tips and are able to take away some of them to try on your own. Take it away, Meaghan! I’d heard friends talk about the race bug, but did not think I’d ever be one of those people. Suddenly I found myself signing up for packages of races with goals to beat my last time. I even started planning trips for big races! 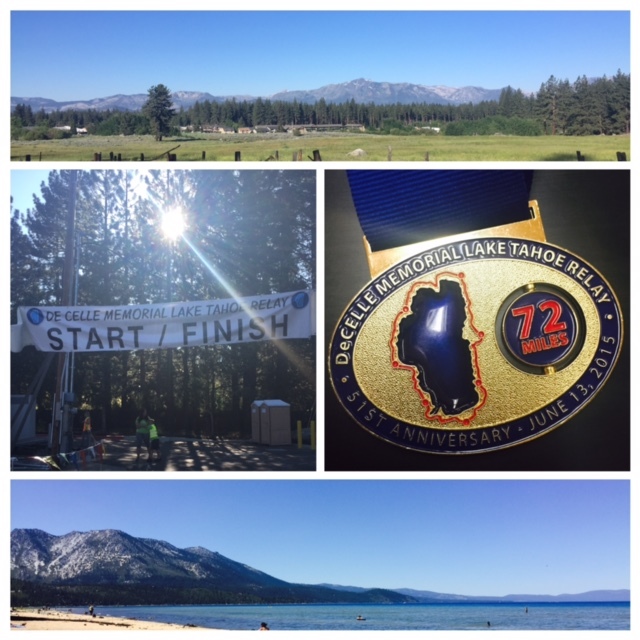 I finished my first half marathon in Las Vegas last year and just got back from Lake Tahoe where I ran a 12.3 mile leg of a 72.2 mile relay race around the whole lake! Incorporate hills: This is a newer one for me, especially living and working in areas that aren’t particularly hilly. I seek out hills a few times a week. The added challenge of the hill makes me realize how much harder I can push myself on a flat. Running laps up and down Beacon hill for 2 miles feels like much more work than a 5 or 6 mile flat course and prepares me to push that much harder when the road is flat. Interval training: Typically I use a treadmill for this since I’m not great at pacing myself using a GPS watch or an app. I like to jog a warm up at my comfortable pace for a mile or 2 then pick up the pace considerably for a quarter or half mile then drop back down to my comfortable pace to recover for a half mile or so, then repeat the process a few times. You never know how fast you can go until you try! This type of training helps me to kick it up a notch when I’m coming down the final stretch of a race. Mental training: Find a way to mentally push yourself for the pace/distance you are trying to hit. For me, I use an app that tells me every 10 minutes how far I’ve gone and my average pace. I set smaller mental goals of how far I want to go by the next 10 minute alert rather than being focused on a goal for the overall run. I make this like a game for myself to see if I can keep the same pace or beat my pace in each 10 minute interval. The right shoes for you: I’ve been tricked by reading about the “right” type of running shoe, buying it and hating it because it wasn’t right for ME. Know what feels comfortable for you and make sure your running shoes aren’t too worn. It’s amazing how much better you can perform when your feet feel good! I hope this is helpful to anyone who is thinking of starting a running program or wants to improve their performance. I’m still certainly not the fastest one out there, but I love seeing how much I’ve progressed in speed and distance of the past year! Thank you, Monique, for asking me to share my thoughts with your B2B readers, I hope to see you all at a race soon! I just love all of these tips- some of them seem so easy, but the reality is that unless you’re an avid runner/racer, you’re probably not challenging yourself by changing it up. I know I’m guilty of running the same route, avoiding hills (what?! they’re hard!) and staying at a pace I know I can keep at for the entire time. I’m not good at pushing myself when running, because, well, it hurts and it’s hard! Thanks so much to Meg for sharing these tips! Let’s sign up for a race together, although you’re way faster than me now which will make it a super hard race! Questions for you: Do you run for time, distance, or both? Do you try to keep your runs “easy” by avoiding hills and not challenging yourself with pace? Do you like to run races? I’m so NOT a natural runner but I’m working up to being able to run a 5K without walking it. I didn’t catch the fitness bug till years after college. You’ll get there! It just takes time and patience!